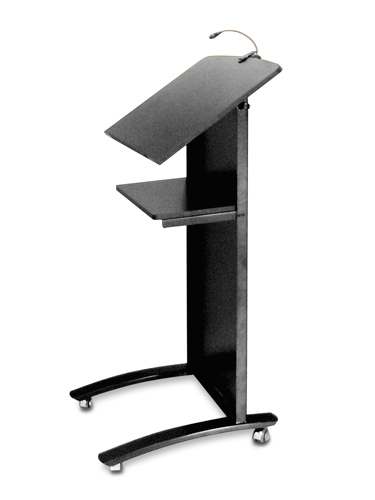 Office Direct - Visionchart Suitable for Corporate Office, Conference Centers, Churches, Schools & Lecture Rooms Professional style lectern. Top shelf size = 600 x 490 Second shelf size: 430 x 290 Approx overall height 1265 (inc wheels) Supplied with stylish 50mm Chrome locking castors. Colour - Mottled black powder coat. This is a flat pack product assembly is required. If you require delivery & assembly this is an added charge. Supply time approx 10 working days.